The meta description of your page has a length of 161 characters. Most search engines will truncate meta descriptions to 160 characters. View Lotto / Lottery Results. Play National Lotto / Lottery: Powerball, South African Lotto, Euromillions, Superdraw etc, & get the Lotto / Lottery Results here. Welcome to Magiclotto.co.za Latest Lotto / Lottery Results: Check your Lotto Numbers to see if you&#39;ve won! Congratulations! The size of your webpage's HTML is 6.82 Kb and is under the average webpage's HTML size of 33 Kb. Faster loading websites result in a better user experience, higher conversion rates, and generally better search engine rankings. Congratulations! Your webpage is successfully compressed using gzip compression on your code. Your HTML is compressed from 31.96 Kb to 6.82 Kb (79% size savings). This helps ensure a faster loading webpage and improved user experience. Your website loading time is around 4.18 seconds and this is under the average loading speed which is 5 seconds. https://magiclotto.co.za and https://www.magiclotto.co.za should resolve to the same URL, but currently do not. Your webpage is using the canonical link tag. 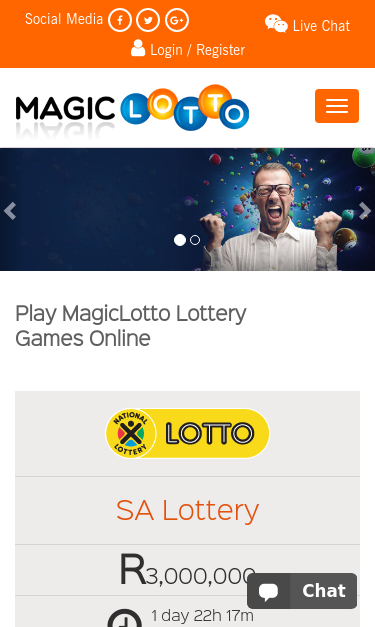 This tag specifies that the URL: http://www.magiclotto.co.za/ should be the preferred version of this page. The canonical tag can be useful when there are similar versions of the same content on several URLs (e.g., such as e-commerce sites where URL modifiers like sort parameters are appended to a product page's URL). Please ensure that this specification is correct, as canonical tags are often hard-coded and may not always reflect the latest changes in a site's URL structure. Latest Lotto / Lottery Results: Check your Lotto Numbers to see if you&#39;ve won!